Pioneers in the industry, we offer dust test chambers from India. 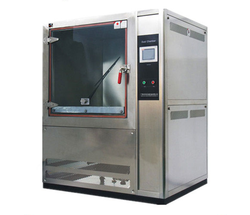 These Dust Test Chambers are manufactured under the supervision of experienced professionals, who strictly follow the established norms and standards of the industry. In addition to this, our professionals make sure to use quality tested material and modern machines while manufacturing. A team of experts monitors every stage of manufacturing, so as to develop a quality range of Safety Cabinet. While manufacturing these chambers, a team of experts keeps vigil on the entire production process, so as to maintain higher quality standards. Details of the product range are given below.